A very well hidden treasure of fantasy folk melodic death metal comes from Vitebsk of Belarus. Forodwaith was formed in 2006 as a melodic death metal band inspired by the books of Tolkien, something reflected on their name too. In the end of 2007 their first demo “Nazgul Attack” was out and the band started touring in Belarus and abroad. In 2010 they recorded their debut album “Nirnaeth Arnediad“, but they managed to self-release it no earlier than 2012. Soon it will be re-released by SoundAge Producions so it will get a proper distribution. “Nirnaeth Arnediad“ has an excellent production and sound, surprisingly good for a debut album, but I should expect it, since it was mastered by Mika Jussila in Finnvox studio, Finland. The band plays technical death metal with great riffs, wonderful melodic lead guitars, nice solos and many folk metal elements in their sound. There are parts where their music is pure melodic epic death metal and parts where they play folk death metal. Except for the folkish guitar tunes, they often use traditional instruments, mostly bagpipes. Since there are no credits in the CD for the traditional instruments, I can’t be sure if they are real instruments or synths, but they surely sound very very natural! Their vocals belong in the brutal side with only a few clean choral parts in some refrains. Vladimir’s black death metal screams fit perfectly with their powerful and balanced sound. I admit I prefer their folk oriented songs, but I enjoyed the rest of the album as well. Their lyrics are all in English and apart from Tolkien themes they are equally influenced by Scandinavian mythology. 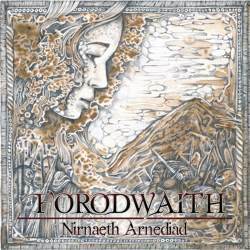 “Nirnaeth Arnediad” includes totally 10 songs, lasting for more than 51 minutes. Forodwaith are not presenting something entirely new, but if you are into folk and melodic death metal you better check their music. Their debut album has nice compositions, technical sound and great production. The band tried to find a label and recently they signed to SoundAge Productions who will soon release “Nirnaeth Arnediad“! The band though has already printed a professional self-released edition of the album in 2012. It comes in a standard jewel case CD with a 12-page beautifully illustrated booklet, including all their lyrics. So if you are interested for more info you better visit their official pages and contact them directly, or wait till the official release date soon. I hope to listen something new from them soon.